She looks totally devastated doesn't she? Jesus. How long has that poor boy been dead? Less than a fortnight, Sabot. Most of us have been more upset when we've lost a beloved pet animal. I cannot imagine what effect this is having on people in Ireland. I have never, ever seen behaviour like it before; most people would struggle to 'forgive' someone who had killed their child in a road accident. To be sitting drinking with someone who's ADMITTED stabbing your son to death is beyond belief. They both sure do love the bottle. You would never, in a million years, think that he had recently stabbed her son to death, would you? If you didn't know better, you'd think they were discussing what they needed from Tesco. Or maybe that IS what they were discussing, and they have managed to wipe Dean's death at his hands from their minds. I like the thinly veiled sarcastic words used by the journo in that piece. Spanish cops probing Amy Fitzpatrick’s disappearance have contacted gardai over her brother’s killing, it emerged last night. Police are working closely with detectives here following the stabbing of Dean Fitzpatrick by his stepdad Dave Mahon two weeks ago, the irishmirror.ie can reveal. And the siblings’ heartbroken aunt Christine Kenny said she now hopes Dean’s death will unlock the mystery of Amy’s 2008 disappearance in Spain. In another development, security sources have revealed several people have come forward with new information about Amy. * WILL apply to extradite any new suspects identified in Ireland. A senior investigator working on the case of 15-year-old Amy said last night that they were “interested” in Dean’s tragic death. The Irish Mirror revealed Dean planned to come forward with new information on the case before he was stabbed to death two weeks ago. Now it is hoped new information will emerge pointing police in Spain or Ireland towards her abductor. The Malaga-based detective was reluctant to give any details on the police’s future plans. He also said that if any new witnesses came forward in coming weeks, his team would consider sending officers to Ireland to record their testimonies. Amy and Dean’s aunt Christine Kenny told the Irish Mirror she welcomed the comments of the Guardia Civil – and despite the trauma of Dean’s death, will continue the search for her missing niece. The blue-eyed girl was just 15 years old when she went missing from Riviera del Sol in Mijas Costa, near the beach resort of Fuengirola on New Year’s Day 2008. The pretty teen was living with Dean, mum Audrey Fitzpatrick and stepfather Mahon at the time. But the last person to see her before she vanished was her best friend Ashley Rose, who was living just 10 minutes away. Ashley recalled how Amy stayed with her to babysit her brother before heading back home at around 10pm. The 19-year-old said on Sunday that she is convinced her friend was killed. She said: “It was someone out there who knew her, that’s my opinion. “I know Amy’s dead. I don’t hold on to any hope of ever finding her alive. The Guardia Civil last night insisted that Amy’s disappearance is still being treated as a “missing person case”. In Dean’s case, gardai are preparing a file for the Director of Public Prosecutions, with charges likely to be brought in the autumn. The 23-year-old was stabbed to death with a kitchen knife in a flat on Brunell Square shared by his mum and Mahon. The father of one fled the building and collapsed on the street outside in Northern Cross, Dublin. Dean’s stepfather Dave Mahon has already admitted to involvement in the killing. However, he claims he stabbed the young man in self-defence. The 42-year-old former estate agent presented himself to gardai the day after Dean was killed. He was arrested but later released without charge. A security source told the Irish Daily Mirror: “Dean’s death has raised a lot of questions among those who knew him and Amy. “They want answers and are prepared to come forward with any information that might be of help to detectives. “Several people have already contacted investigators and hope to testify soon. Gardai can be contacted on Coolock Garda station on 01 6664200, or the Garda Confidential Line on 1800 666 111. Thanks, Rhodes, that answers a lot of questions, doesn't it? And I don't think there will be much doubt about who that is, either. It's bad news, really, because I did still have a faint hope that Amy had run away from the pair of them. I just cannot imagine how Dean and Amy's dad, and aunt, feel just now. If this was a movie, it would be dismissed as too sick and twisted to be believable, but sadly, it's real. Maybe all they can hope for now is for Amy's remains to be found, and the perpetrators brought to justice? I'm rather stunned they are wanting the High Court to say that because 7 years will have passed by next year the coroner could issue a death certificate for her and they can bury some of her things with her brother. IMO, they are frantic to keep everything swept under the carpet, Rhodes. And the very fact that she's so keen for Amy to be declared dead raises suspicions, anyway - because there is only one way she can KNOW Amy is dead, and hasn't just run away. Dave is getting to a stage now where he has to think of himself because of the ongoing investigation and of what people might be saying about him. I have no doubt that Aud'n'Dave are thinking of themselves, they seem to be good at that. I don't see Amy and Dean's father letting her away with a stunt like that, anyway, Rhodes, it's pretty obvious who the police and press are looking at as being involved in Amy's 'disappearance'. 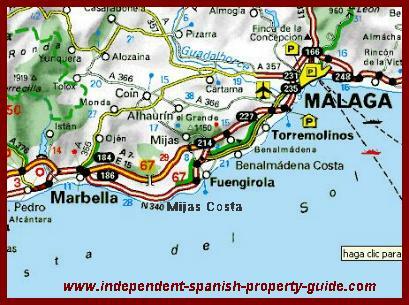 Anyone got a map of the immediate area in Spain where they lived? That's the general area, Sabot - I believe she was living in the Mijas Costa area. Thank you, Bonny. Any mine shafts or cliffs nearby? Mind you, if you have three days to cover up a crime, you have ample time to head out to sea, or inland. Ah, yes, I briefly forgot the three days. Three Days? After Audrey insisting that Amy wasn't neglected and she always knew where she was, and kept in touch? Something doesn't add up right there. It won't have taken three days to ring round all of Amy's friends. But probably they didn't want The Police around too soon. This is beginning to look very bad indeed. Although I do still hope that Amy ran away. Ashley Rose, 19, was the schoolgirl’s best pal in Spain when she disappeared without trace nearly six years ago in the beach resort of Calahonda, near Malaga. Now the heartbroken teen says she is convinced Amy, 15, was murdered and the person who killed her is out roaming the streets. Ashley is convinced Amy was killed and she believes she knows who did it. All the horrible memories of Amy’s shocking disappearance came flooding back this week when Ashley heard her best pal’s brother, Dean, 23, had been stabbed to death. The 19-year-old said she was in deep anguish for Amy’s dad, Christopher, who has now lost two children. Speaking from London, she said: “There is so much going on and I really feel for Christopher. He must be furious. He’s lost both his children and then he had to deal with a court case. “He had to fight for the right to be involved in his own son’s funeral. I think that’s the shocking part of it. Tragic Amy spent her last night before she disappeared at Ashley’s house. The girls had a sleepover and then Amy left to go back home to her mum Audrey and stepfather Dave Mahon’s house. But the bubbly youngster never completed the journey and has never been seen since. Ashley recalled how stressed Amy was over her family life at the time, and that she’d regularly come to her door in floods of tears. Ashley revealed she was devastated when she learned of Dean Fitzpatrick’s death. Mr Mahon was arrested by gardai earlier this week over Dean’s death but was later released without charge. He claims he was acting in self-defence. Ashley said she was never in Amy’s house when Audrey and Dave were there. She said Amy only brought her to her home when her mother and step-father were out. Amy’s heartbroken friend said she has one poignant memory of her best pal before she disappeared. Ashley said: “All she ever wanted to do was come back to Ireland. She hated it in Spain. “She had no real reason to hate it other than wanting to see her dad. Amy didn’t want to be there anymore. “They were meant to go to Ireland on Boxing Day, Amy and her mum. Flights were booked and she was so happy, she was moving back. And the next day there she was at my door crying, saying she’s not going.Then two weeks later, she was missing. Earlier this week, Ashley’s mum Debbie Rose revealed she will be forever haunted by the fateful New Year’s Eve when Amy and Ashley baby-sat for her. She explained how the next day Amy asked if she could stay with them but Debbie thought it was best if she went home. The tearful woman said: “I said it would be better if she went home and wished her mother a Happy New Year. On Friday, Amy’s dad Christopher Fitzpatrick spoke of his relief after the High Court gave custody of his son Dean’s body to the young man’s grieving partner, Sarah O’Rourke. The heartbroken dad told the court he wanted to bury his son where he hopes to one day place his missing daughter Amy, if her body is found. She revealed: “I don’t think Amy liked Dave and neither did I. Amy told me she was never comfortable around him. They were meant to go to Ireland on Boxing Day, Amy and her mum. Flights were booked and she was so happy, she was moving back. And the next day there she was at my door crying, saying she’s not going.Then two weeks later, she was missing. That was a shockingly cruel thing to do to any child, especially one as unhappy as Amy. Hopefully, the Gardai/Guardia Civil will be getting to the bottom of rather a lot of things over the coming weeks. SPANISH police are being urged to formally interview the self-confessed killer of Dean Fitzpatrick about the disappearance of his sister Amy, after crucial new evidence appears to have emerged. We also reveal how Spanish police have also been told about sensational new evidence relating to Amy’s mobile phone. The papers are all but saying what everyone is thinking in private now. Her Mobile Phone, eh? That one always was dodgy. Yes, that is most odd - teenagers cannot be separated from their phones, yet Amy's turned up on her bed. I hope for Dean and Amy's father and other real family (I refuse to regard Aud as such after her antics this week) that the Irish and Spanish police can get to the bottom of all this fairly quickly. I don't hold out much hope for Aud'n'Dave telling the truth voluntarily, unfortunately. If this pans out the way many expect it to, they have not only hidden the truth about Amy's 'disappearance', they have carried out a massive con trick. That is what is worrying me. Evidence after all this time. If they both refuse to change their stories, what can be done? Regarding the phone call that Audrey says she made to Amy after midnight on New Year's Day, while I have made some mystery of this, we don't actually know which phone she dialed, either the house Land Line or Amy's Cell Phone, but it has to be one of them since Amy left her friend's house at around 10pm on New Year's Eve. Unless Amy phoned Audrey, which seems unlikely. But the whole thing needs pursuing. Maybe people in Spain, especially Amy's friends, won't be scared to speak out now Good Old Dave is heading for a jail cell over Dean's death? He isn't going to be in any position to puff his chest out and strut around like a TV gangster? Amy's friends do seem to have information; I'm saddened that they believe Amy is dead, that there now seems to be no chance she ran away from 'mam' and her live-in thug. I know nothing about Spanish law, but I noticed in yesterday's report that the GC said the investigation was ongoing. They may have/will find forensic evidence that makes it immaterial whether or not Aud'n'Dave alibi each other? Wonder what would have happened if the wonderwoofs had been sent to Hacienda Aud'n'Dave a couple of days after Amy 'disappeared'? Amy Fitzpatrick’s family have urged Spanish police to start their investigation again from scratch. The missing girl’s dad Christopher Fitzpatrick and her aunt Christine Kenny hope a new probe into her case will help them find answers. They hope that going over every piece of evidence will bring new leads — just as it did for missing Madeleine McCann’s family. Christopher and Christine made the appeal a day after the Irish Mirror revealed Spanish cops have stepped up the hunt. Now they believe another investigation will finally unlock the mystery of the 15-year-old’s disappearance in Spain in 2008. “They need to start from the beginning, perhaps with a new team of detectives who can look at the case with fresh eyes. “Everyone who gave evidence in 2008 should be questioned again in light of everything that has happened over the past five years. Determined Christine revealed that her and Christopher would happily give testimonies and do anything in their power to help detectives. Sources told the Irish Sunday Mirror inspectors may have to travel to England to gather evidence. A security insider said: “A handful of people who knew Amy and gave evidence in 2008 have left Spain. “Some moved away out of choice, but there is a concern that others moved away after being intimated. It comes as Amy’s family are today visiting her brother Dean’s grave. The 23-year-old was stabbed to death on May 25 at the Dublin flat rented by his mother Audrey Fitzpatrick and her partner Dave Mahon. Chief suspect Dave has already admitted he killed Dean, but insisted he did it in self-defence. The couple revealed this week they had quit the search for Amy. Amy’s relatives mentioned the review of the Madeleine McCann investigation which was launched in 2011 after a campaign from her parents Gerry and Kate. Gardai can be contacted on the Garda Confidential Line 1800 666 111.